Membranous glomerulonephritis may present with proteinuria, hyperlipidemia, edema and hypoalbuminemia as well as azotemia. Membranous glomerulonephritis is the commonest from of adult nephrotic syndrome. There will be granular pattern of IgG or C3 deposition. Immune complex may deposit in the subepithelial position within the basement membrane of the glomerular capillary walls. 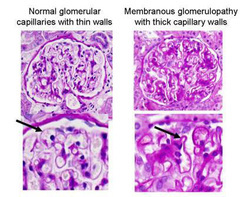 Membranous glomerulonephritis may also reveal diffuse thickening of the capillary wall and thickening of the basement membrane. Spike ( the basement membrane) and dome ( deposition of the immune complex) appearance may be detected with silver methenamine stain. There will be basement membrane between and around immune complex deposition. Membranous glomerulonephritis is an immune complex disorder. Membranous glomerulonephritis may also associated with malignancy, syphilis, captopril intake, gold salt intake,malaria, SLE and penicillamine. The main complication of membranous glomerulonephritis is renal vein thrombosis. Membranous glomerulonephritis is best treated with ACE inhibitor and cyclophosphamide. 1.Wasserstein, Alan G. "Membranous glomerulonephritis." Journal of the American Society of Nephrology 8.4 (1997): 664-674. 2.Rosen, Seymour. "Membranous glomerulonephritis: current status." Human pathology 2.2 (1971): 209-231.